When I was growing up, one of the most prized possessions in our household was the complete box set of The Beatles. It was in a large box – the size of a large pizza box (even though in those days pizzas came in round shredded-cardboard boxes and came from proper pizzerias where they threw the dough in the air before dousing it with sauce!) The six (or was it nine) cassettes were housed inside. We had to ask for permission to open the box just to gaze at them and I was a teenager before I was allowed to actually take one out and put it in the tape deck. As I got older, I came to appreciate more and more the music on those tapes. In my final year of high school those tapes (especially the later albums) got a work out. My best friend Michelle and I spent more time listening to Golden Oldies from the 60’s (Simon and Garfunkel, the Monkees, etc) than anything actually charting in 1991. I remember vividly cranking the stereo up as far as the homemade speakers could cope, Revolution filling the loungeroom while my Dad was out. There was something rebellious about listening to that song really, really loud (and being almost 18 and bouncing on the club lounge knowing the lady who lived next door was deaf and wouldn’t dob on me). Several weeks ago my Dad told me he had a surprise for Dave and I. We were heading out together Friday night. That’s was much as he told me. Friday morning, he sent me a text message to say our surprise was on the mantle piece. It arrived while we were waiting for the luggage to come off the ill-dated Virgin flight. He’d dropped hints before we arrived in Victoria: it was something we’d both love, it was something he’d seen before and it was something which amazingly just happened to be in town for the first time in six years. I had an inkling what it might have been and was ecstatic to discover it was tickets to see John Water’s Looking Through a Glass Onion. Dad saw it on the very first tour back in 1999 when we were living in Cairns and raved so much about it, I wished I’d had the chance to see it. Now it is my turn to rave about it. This comes with a disclaimer… I still harbour a bit of a girl crush on John Waters from my pre-pubescent days of being smitten with him as Brenton Edwards in All the Rivers Run (I don’t remember him from his days on Play School – though my Mum does. You can’t tell me they don’t cast for Play School simply on talent – but for the eye candy factor of the parents who watch it too). 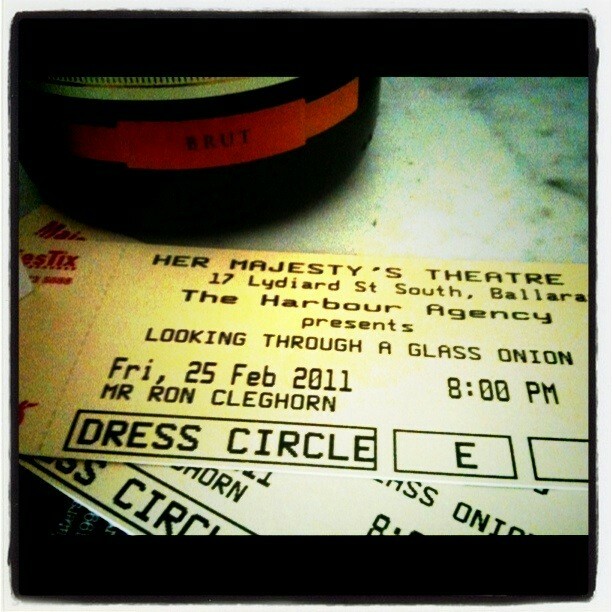 Looking Through a Glass Onion is the critically acclaimed homage to the music, mystery and memory of John Lennon. The show was first staged in 1992 with a five week run in a small cabaret room at the Tillbury Hotel in Sydney as a two man show and has since toured the West End of London, New York (where he eventually got Yoko Ono’s approval) and several more Australian tours. We saw it at the historic Her Majesty’s Theatre in Ballarat as part of the 2010/11 tour which coincided with the 30th anniversary of Lennon’s death last year. Waters’ birthday is also the 8th December – the date of Lennon’s death. The show begins with a lullaby and several guns shots and John Waters strides out on stage to the microphone and begins a monologue about a man standing on the other sideof the street, a copy of Catcher in the Rye in hand. Then the singing starts and time slips away. The first part of the show focuses on the early years and the music of Beatles, the second part more on Lennon’s life post Beatles with the end coming full circles to the opening section of the show. The intersection of the songs and Lennon’s words isseamless, with the spoken words giving insight to the songs; the songs providing a greater depth of understanding to the spoken word in an increasingly powerful spiral of entertainment. Waters’ voice is raw and powerful in song; in the spoken word he conveys a mixture of humour, empathy and humility through Lennon’s words – with just the right amount of accent. I realised most of my favourite Beatles songs were from the pen of Lennon: All You Need is Love, Norwegian Wood, Revolution, Come Together. Yes I cried (several times)… the moments when the music fills you up to spilling point and your appreciation comes out in a torrent of tears (good thing it was very dark). I actually don’t think there was a single dry eye in the house as the first verse of Imagine filled the historic theatre. Walking out at the end, filled up with musical love (and committments to purchase all The Beatles and Lennon albums), I realised something odd. For the first time, in a long time, Dave and I were on the younger end of the audience spectrum. Thank you Dad, as always, a perfect present and the perfect way to cauterise the dramas of cancelled flights, 5am flights, seating debacles and an emergency landing, which all led up to us arriving in Ballarat. 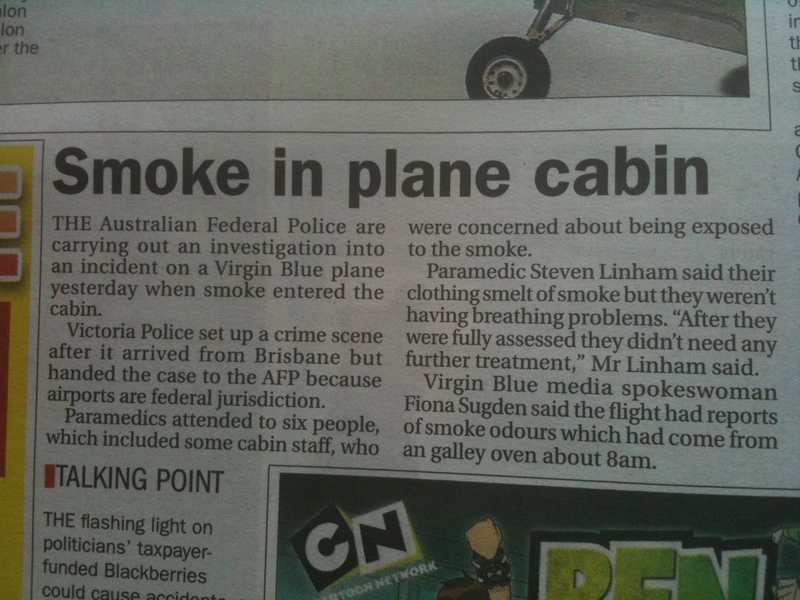 Sure, Friday’s flight wasn’t on par with that… but smelling smoke in the cabin and seeing the general rush of people from the back of the plane to the front, and the head flight attendant having a panicked looked in her eye despite her outward version of ‘calm-in-the-eye-of-a-crisis’ – well that’s just plain frightening in its own right. 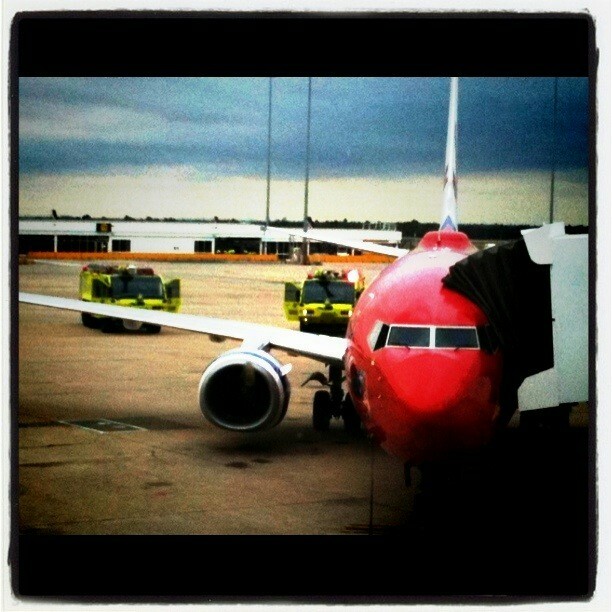 We weren’t even meant to be on the 5am flight out of Brisbane, as I blogged Thursday. There was talk of oxygen masks being dropped, and assurances there would be enough as the head flight attended squeezed too many people into not enough seats up the front… and a horrendous smell permeating up from below our seats and up the side of the cabin (even up the front where we were sitting). Mr D squeezed in between Dave and I, so a man from down the back could sit in Dave’s original seat, his head buried inside his tshirt and complaining he was having trouble breathing. Even when we found out it was a stove in the aft galley causing the drama, that it was now under control and it was unlikely the oxygen masks would come down – I didn’t feel any better. There is something about panic, even once the worst of it has past, which continues to skew your perspective. The realisation of just how vulnerable you are up in the air… and the heat and pressure of your six year old sitting on your lap. There was a rush to prepare the cabin for landing and down we went. I was looking out the window as we cut down throught the top layer of clouds and then through the lower lying clouds, feeling the urgency in the descent. On needle points as the fetid air oscillating up every few minutes and I turned away hoping it wasn’t something going wrong again. We were cleared for an emergency landing ten minutes ahead of schedule and touched down with the plane overloaded unevenly weighted and coming to a very slow stop. 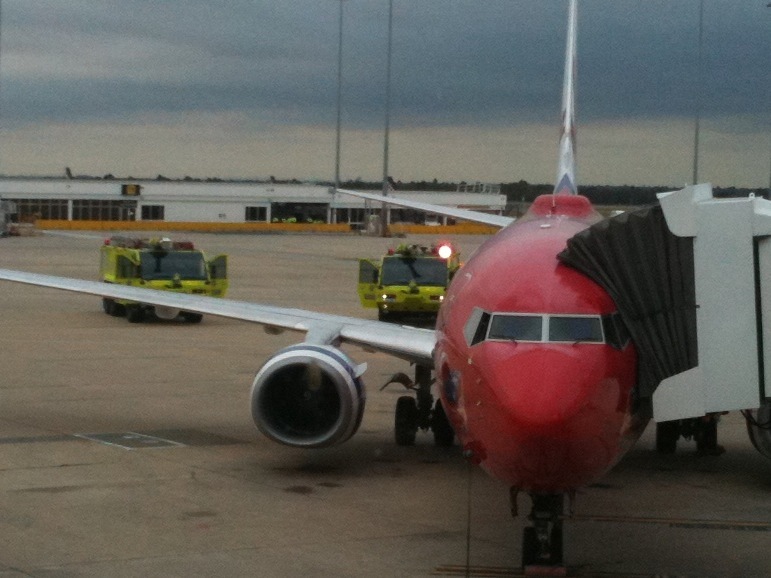 We pulled up opposite four fire trucks waiting on the tarmac. We were instructed to sit quietly until we were given the clear to exit and everyone had to get off through the front doors. The people now sitting up the front waiting to go back to retrieve their belongings. Only one other time (the trip in NZ) have I been so glad to finally make terra firma. On the concourse we were able to look out over the emergency vehicles converged on the plane and further down a reporter and camera man were stopping people to interview them. I joked to Dave as we waited at the baggage carousel they should have stopped us. We could have told them how we were never meant to be on that flights – ours had been cancelled the day before. About how they’d booked our seating with all of sitting apart and Mr D, 13 rows behind in row 21 by himself. And then the oven caught fire! I was asked on Thursday what the Universe was telling me: decided it was telling me to appreciate what I had. To stop and smell the roses. And I did just that once we were in Ballarat, heading up the mainstreet for a gourmet pie. There were plenty of front gardens in bloom and we stopped at every single one. Instead of touching down at Tullamarine Airport in Melbourne to welcoming hugs and grins from my Dad, I’m still in Brisbane, compliments of a cancelled flight. Stuck home dealing with a moth infestation in my pantry, about to tackle a nit treatment with my six-year-old son and wondering where my sweet, chilled-out break went. That sweet, chilled-out break? It will have sent an agent for us, I know. They’ll be there, peeping around the corner of the ancient train station, beckoning us. Would You Look at My Story? Places are limited to ensure the highest level of interactivity between the participants and myself, so please book early. Please bring with you a pen and something to write on. We need to vacate the premises at 1:00pm but I am happy to meet with the participants for a casual lunch in a nearby cafe if anyone has any recommendations. For more about me and my passion for running this workshop see my official workshop page. Booking can be made by paypal or content me direct jodi[at]jodicleghorn.com for direct debit details. Ballarat Writers Centre members are eligible for a discount. When filling out the enrolment form, please put your membership details to validate your discount! Forget the Hallmark Holiday… the 14th February, 2011 will be remembered not for the feeling of ecstacy or disappointment whenwe are noticed or forgotten by those we love or desire, the chocolates we did or did not get, the flowers we did or did not get, the cards we did or did not get… but the stories we got. This Valenties Day that is the one thing you can rely on. Nothing But Flowers (Literary Mix Tapes’ Valentines Collection) launches in just over seven hours. The concept was conceived on the road between Ipswich and Brisbane, coming home from our brief holiday break in New South Wales. I”d been racking my brain for almost two weeks to come up with a suitable song (or selection of songs), weighed down the entire time by the prospect of an entire anthology of sappy love stories… which was not what I wanted to create and I’m pretty darn sure, the writers who were keen to be involved, were not interested in writing. As always, I wanted to create something different, left of field! Several things happened on that 15km stretch of road. 3. The charity which first came to mind was a local women’s shelter and the idea of love after a post apocalyptic event was seeded. 4. By the time I pulled into my driveway I knew whatever money came in had to go to the flood victims in Queensland, whose apocalypse was very real. This was before the flash flooding in Toowoomba. This was before the wall of water went through the Lockyer Valley. This was before Brisbane was flooded. This was before 100 Stories for Queensland. A week later I looked at the highway at Goodna, around the same place where the idea for Nothing But Flowers came to me. It looked like a war zone… the road cratered from the aerial shot, huge sections ripped away by the sheer force of the water. I went from imagining an apocalpse to seeing it played out just up the road from me. It has been a freaky few weeks – reading and editing these stories, and watching floods and a cyclone ravage my home state. Not to mention having gone from sensible doable deadlines to a collision of three major projects. The 26 stories which make up the entire collection (24 will be published on the web and 25 will we published in the eBook and paperback, including stories by Paul Servini and myself)not seen on the web) run the full gamut of post apocalyptic life, both on terra firma and in space. The stories range from dealing with cancer to fleeing a fundamentalist government; there are floods, earthquakes, viruses, war, disappearing animals and the open road. Love takes the reader from a take-away coffee mug to a gun to the head, from a fortune cookie to a guitar. You’ll never think of love in the same way again. The 26 writers involved have pushed the barriers of apocalyptic thought and peeled back the layers to the most intimate level, to explore the way people love and allow themselves to be loved. The stories are horrifying and heart warming; they will rip at your soul, tug at your heart strings and make you laugh out loud. I’m am awed at the stories in this collection and believe the stories are ones readers , reviewers and critics will be talking about for a very long time. There is not one soppy line, nor a single contrived piece of dialogue. 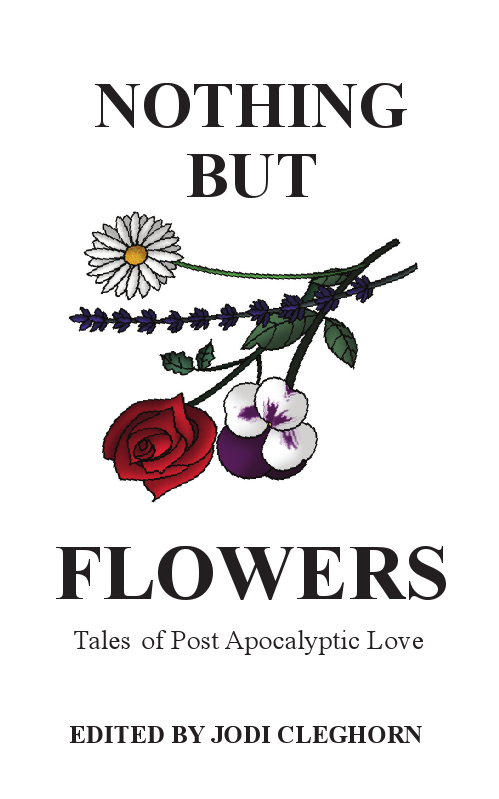 And while the stories are littered with references to flowers, the only ones carrying bouquets are the walking dead. The collection goes live at 9am (AEST) and will be available free on the website until Wednesday 9am. After that the book will be available for download as an eBook ($4.95). Wednesday you will also be able to place your pre-release orders for the paperback. How to get the good stuff! You can like the official facebook page to get hourly updates with links to the stories. Attend the virtual launch on facebook and go into the running to win one of four eBooks or a signed paperback, mingle with some well known names in fiction and see a bunch of authors behave badly without fear of a virtual hangover. And of couse you can read and comment on the stories at Literary Mix Tapes. First published at Write Anything: Monday, 9th February, 2009. Ideas for writing come from all sorts of places. I have to admit, personally, coming up with ideas for what to write is something I have always struggled with. Good, original, sustainable ideas that capture and hold the reader seem even rarer in my world. That’s why when I returned to the page in October 2007 and was directed here to [Fiction] Friday by my wonderful friend Danae, I thought all my Christmases had come at once. I didn’t have to think up the idea – just had to gestate and put down the story. Left to my own devices – I would probably write very little. I would always be searching for the ‘perfect idea’ and let’s be honest – there is no perfect idea. 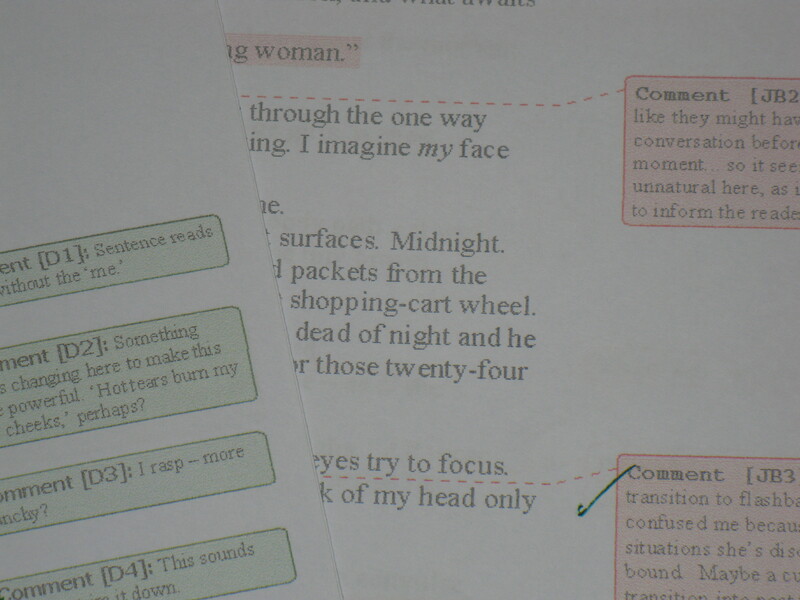 Prompts bypass the need for perfectionism and allow writers, like me, to do what they’re best at – write! It’s not always easy though. Using a prompt as the impetus for a piece of work can challenge you – especially if there is no light bulb moment to assist you in those first few minutes after reading the prompt. It can almost be more frustrating than having no idea at all. Sometimes you’re lucky, other times you’re not. There are weeks when I stare at the [Fiction] Friday prompt and feel like an unlucky fisherman, continually casting and dragging in nothing but a slightly nibbled piece of bait. In these moments I begin to ‘freak out’ and lose faith in my abilities as a story teller. Who cares – it’s just [Fiction] Friday – the world won’t stop rotating on its axis if I don’t post (even if I have committed to writing one a week). But if I give up because a prompt is too hard, the idea wont come, the story isn’t clear, the characters are ambiguous or I don’t like them, it sets up a negative avoidance pattern for when things get tough. And I don’t need that for my journey. After all it’s rarely smooth sailing all the way. It’s good to have a back up plan for these times, rather than rely on luck, serendipity or begging or the return of your creative inspiration to get you through. So what about a Plan B? In moments of extreme creative drought I’ve turned to my writing oracle. Women Who Run With Wolves is a feminist psychoanalytic exploration of fairy stories – mainly very old ones to do with women’s rites of passages. When I first got it (a wonderful $10 buy at bookstore that helps to support a women’s shelter in my home town of Cairns) and began reading, a friend told me that it could be used for bibliomancy. That is, you can hold a problem in your head, open to a page and find some wisdom to mull over. More recently my soul sister told me that she’d it in the same way as a writing oracle. Since learning of this useful trick I’ve turned to it twice. The most successful was the creation of Demon Lover (inspired via a dream from a paragraph in the story The Red Shoes) – a short story that I actually sold last year! It’s a good fall back, when the flow of ideas dam or dry up. Julia Cameron, author of The Artist’s Way suggests that if you’re stuck or blocked to mend a piece of clothing or to bake something – the physical process of fixing and mixing works at a creative/unconscious level. A friend of mine swears by this, as she does about knitting to keep the creative flow moving. Sewing, cooking and knitting are not everyone’s cup of tea though. Mundane, everyday, repetitive tasks have the ability to still the mind. Many artists and writers say their best ideas/plot revelations/characters developments happen in the shower, while hanging clothes on the line, driving the car or walking. Just write – it doesn’t matter if it is bad or indifferent. The simple act of writing generates momentum. Writing badly is painful – but it’s not nearly as awful as not writing at all. Create a scrapbook that you keep handy, where you can write down things or glue images that you like: words, sentences, ideas, plot, characters, colours, poetry, images etc. They don’t have to have any real shape or purpose – just things that strike you as being interesting. Make friends with your bad/imperfect ideas. Like new friends – give them a chance and they may just surprise you. Put your music on random and take the first line of the first ten songs and try to create something from that. Or listen to your favourite album, or something from a friend or partners collection that you have never listened to and do the same. Or just let the music wash over and through you. Keep a record of your dreams. Some of the best stories have deep roots in the dream sphere. Even if they are just snippets or glimpses rather than a whole story downloaded to you while you sleep. Have a word bucket – as described by Andrea. Go for a walk – take your muse out for some fresh air and a new perspective. Indulge in your favourite mundane task – wash the dishes, fold the washing, take a shower, hide away in the toilet. You know what works best for you. And remember that writing is meant to be enjoyable. Having a list handy of the things that help to stir your creativity is a useful tool – a Plan B, for the moments when writers block hits or the ideas just refuse to come. Type it up, write it out, make it pretty, make it practical – but stick it up somewhere you can see it. If it’s filed away in the bottom of your desk draw it’s not going to be any use … you’ll forget it’s there in your frustration. Sometimes writers need safety nets. We may as well weave ones with plenty of spring to propel us upwards and onwards. What tricks do you use to feret out ideas for writing? How do you keep the creative juices flowing, and your ideas alive and brilliant? Thanks to Eamon and Tricksie Pixie who shared their creative prompts with me last year. When I was eight my parents decided they wanted to live in the country. In the months afterwards we drove from Melbourne every other weekend to look at houses and farms between Kynton and Castlemaine and across to Daylesford (where we ended up settling on a 20 acre hobby farm). From the back of my Dad’s grey Peugeot 504 we saw a far bit of the countryside. After a few trips we noticed the sign posts to Spring Hill. No matter where we were, which junction we came to, there was always a sign to Spring Hill. It became the family joke – all roads led to Spring Hill. When I look back on the last four years, all roads lead to Write Anything. If the fertile area between the Euphrates and Tigris Rivers is said to be the cradle of humanity, then Write Anything is my cradle of creativity; the womb of my writing. It is there I first ventured to share my stories. It is there I met Paul Anderson and a bunch of other talented and crazy folk. It is there I first had the confidence to share my ideas about writing, editing and creativity. As I spoke about last week, Write Anything is entering a new era. Today is my first post across there for a few months, and the first belonging to the new era. Rather than being a weekly columnist (Monday was my day for two years) I’m now Deputy Editor (under Paul) and pod editor for four excellent new writers (three who are brand new to me). The post today is not terribly interesting… talking about yourself never is. Writing at midnight also doesn’t lend itself to anything particularly brilliant either. Tomorrow is my three year anniversary at at WA and I’ve cued up my first official blog post from there to share tomorrow. Until then… a little bit of Miss Hisler. I have finally got around to reading Stephen King’s ‘On Writing: a memoir of the craft’. Not far into it I discovered a rather honest and confronting example of what I call ‘writer’s shame’. By 1987, when King was forty, he had written 17 novels under his own name, another five under the assumed name of Richard Bachman, three collections of short fiction and had collaborated on a number of film adaptations of his novels. The most financially successful horror writer in history, at the height of his career, was still ashamed of his talent. It would be incomprehensible to believe that such an author could feel this way, if we hadn’t experienced the exact same type of shame and doubt ourselves. We all have them, a Miss Hisler or perhaps a whole crew of her monster archetype, who hang out in the recesses of our memories, on the periphery of our creativity. They load us up with shame about our writing, dishing out their own versions of ‘how could you?’ that block us. 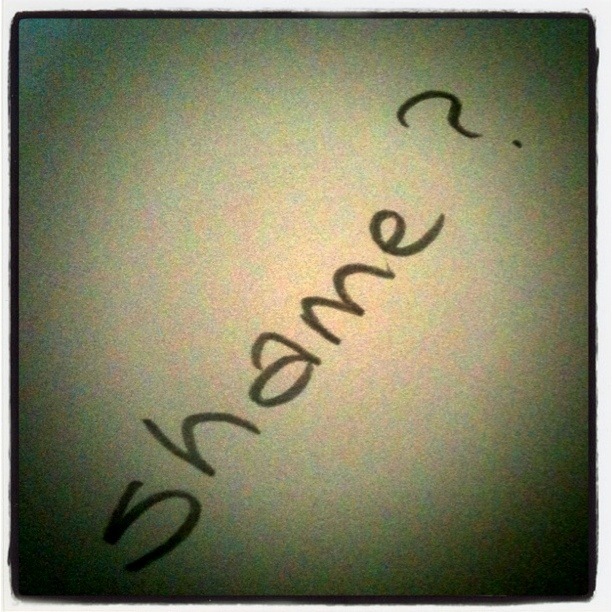 I ousted my Miss Hisler last year, after working through the section on shame and monsters in The Artists Way. He was a Writer-in-Residence in my first semester of uni – I dont remember his name now. Upon reading my work he told me quite bluntly my writing was naive; I needed to ‘go out and get a life’ – which pretty much devastated any confidence that I had built in my writing through high school. I was 18, impressionable and took his words as gospel. What I heard was that I wasn’t good enough to write – ‘how dare I have the adacity to think I could?’ So much for all the encouragement and support I had received from my teachers and parents. Only last year did I return to writing, with the passion I had once had, with enough confidence and sass to make my work public – a good 16 years on. I don’t feel the need to pay homage to my monster’s legacy any more. And good riddance I say. I’ve let go of the notions that I’m not smart enough, good enough, nor worldly enough to write. I have the audacity to write badly sometimes, and feel OK about it. I have the confidence to try new things and experiment with my boundaries. And I’ve reclaimed the thrill – the pure, unadulterated love of being encapsulated in the fiction I create. We all have our Miss Hislers. Naming them and sharing the damage that they have caused us, goes a long way to healing the festering wounds left in our self confidence and creativity. Who are your shame monsters? Today is your opportunity to oust them. What was the shaming charge/s levelled at you? How has it poisoned the way in which you perceive yourself as a writer and your ability create?